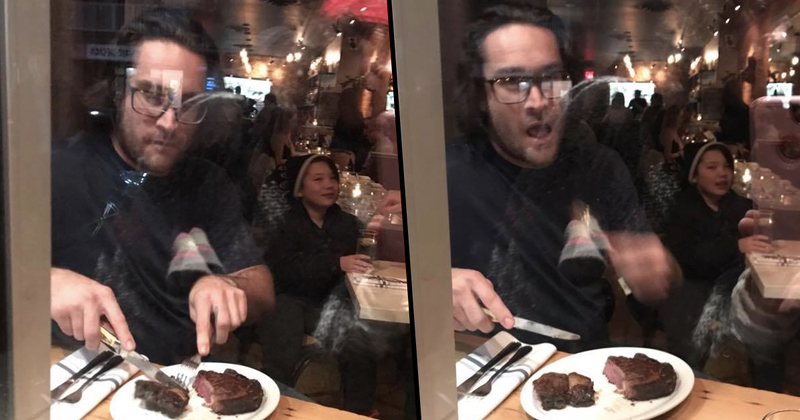 For the Toronto restaurant whose owner started eating a steak in front of a group of vegan demonstrators business is allegedly booming following his controversial reaction to the protest. 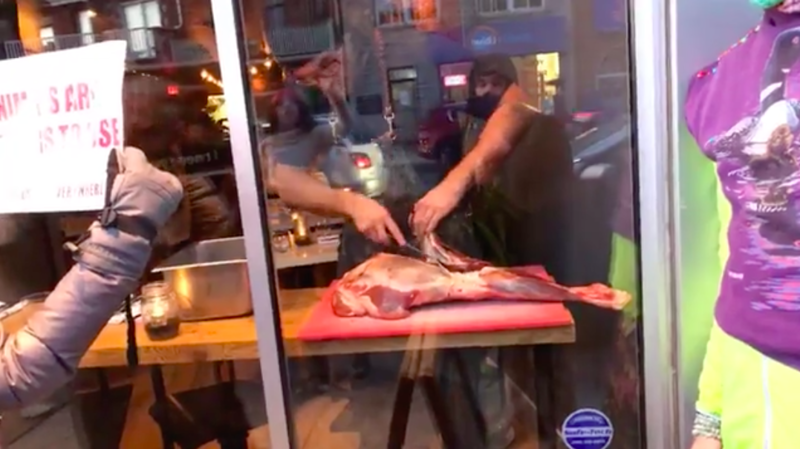 The footage of Michael Hunter carving the leg of a deer and tucking into a steak in the window of his restaurant while vegan demonstrators protested outside went viral a couple of weeks ago. 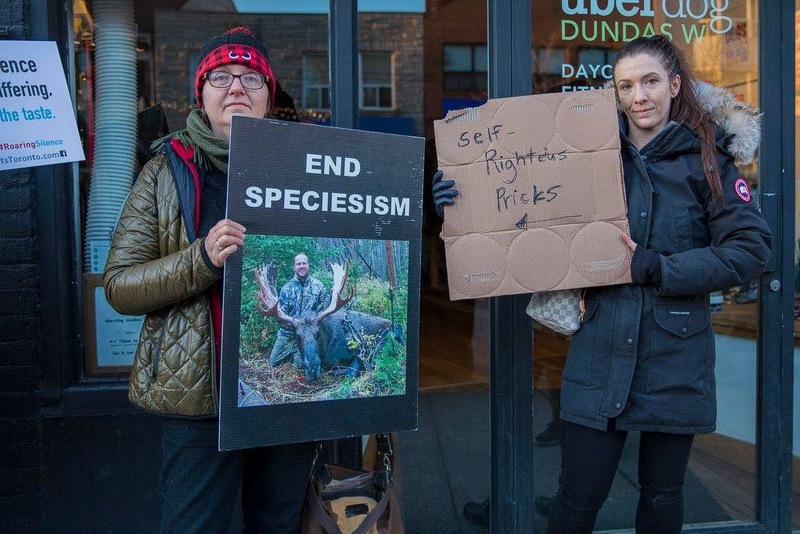 The activists returned to Toronto’s Antler restaurant last week in order to create a dialogue with the owner, and were met with one counter-protestor, a friend of the restauranteur, holding a sign reading ‘self righteous pr***s’. The people that sit at his restaurant just take business from somewhere else. These are people who would consume a dead animal, and they’re just doing it there now, so that’s fine. I do find it interesting that everyone is going nuts saying I’m impacting his business. People feel sorry for the small businessman. The animal is not yet allowed to be the victim. Nobody wants to acknowledge that. If people were to watch him before he was about to kill the animal, they would likely stop him. It’s cognitive dissonance. His business is already on the map at this point, that’s not a concern. It’s for the animals. 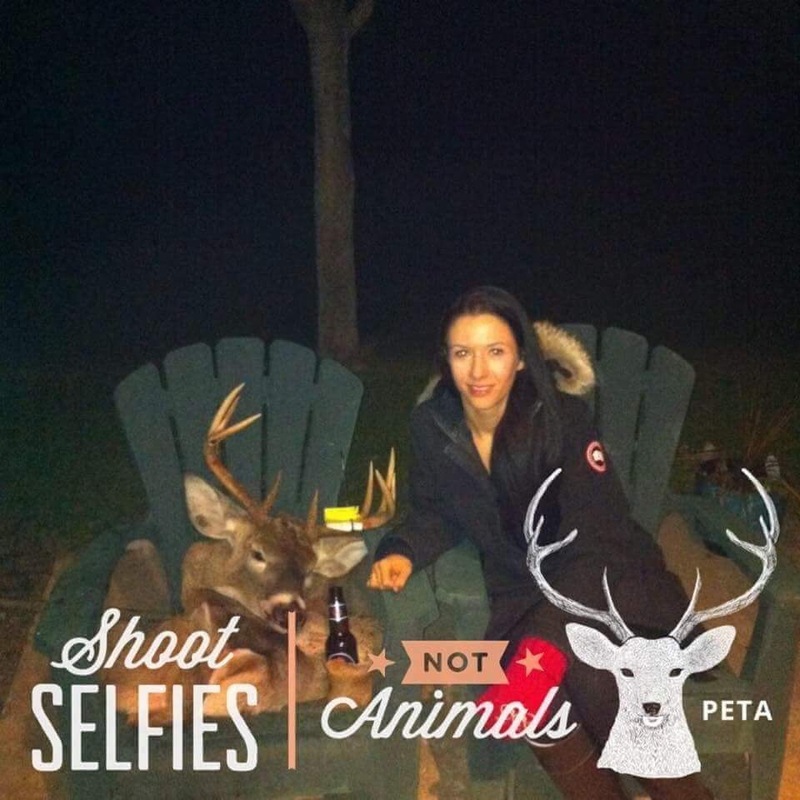 The counter protestor (below) is a fellow hunter and posted an ironic ‘PETA sponsored’ photo captioned ‘shoot selfies not animals’ that included her sitting next to a dead stag. While at the protest, Nicole the counter protestor, donned a misspelt sign and a Canada Goose coat which has the fur from a coyote around the hood. Michael Hunter and Nicole have both been approached for comment, but are yet to respond. Marni is keen to highlight the issue of speciesism, which involves the assignment of different values, rights, or special consideration to individuals solely on the basis of their species membership. She explained that they ‘do activism for the animals’ and are ‘not there to attack or destroy anyone’ but to ‘have dialogue, educate, change things, be the voice that the animals don’t have’. Similar to racism or sexism, it’s another form of discrimination. Our culture puts booties and jackets on their beloved dogs while keeping pigs in darkness and killing them for food. We say you’re a dog, you’re worthy of a life filled with love but you’re a pig, cow, chicken, you’re not. Yet all animals, just like us, are sentient beings. We have central nervous systems, bleed, form family and friendship bonds. Spend time on a farm sanctuary if you doubt that. I will repeat, yet again, Michael Hunter/Antler are not ‘my victims’ the animals are THE ONLY victims and if you don’t understand that, YOU ARE A SPECIEST. If the leg of the deer was the leg of a dog would this be a case ‘attack on the small businessman’? If they’re doing more business for a while as a result of this compassion campaign, that means other restaurants are doing less business. Because, of course, these protests aren’t creating new meat eaters. At the most they’re diverting people from one restaurant to another for a while. The only thing literally booming around the world is global discussion about the torture and killing of animals for no necessary purpose. Millions of people are now discussing the issue, are now discussing our long standing abuse of animals. I can only imagine how many people are reducing and eliminating their consumption of animals, going vegan, saving the animals, saving their health, and saving the environment as a result of the Antler compassion campaign. If Hunter displays a sign reading ‘Animal’s lives are their right. The desire to live and capacity to suffer, a dog is a pig is a dog is a boy is a girl. There is no right way to exploit an animal’ in his restaurant, Marni said ‘we will go away’.